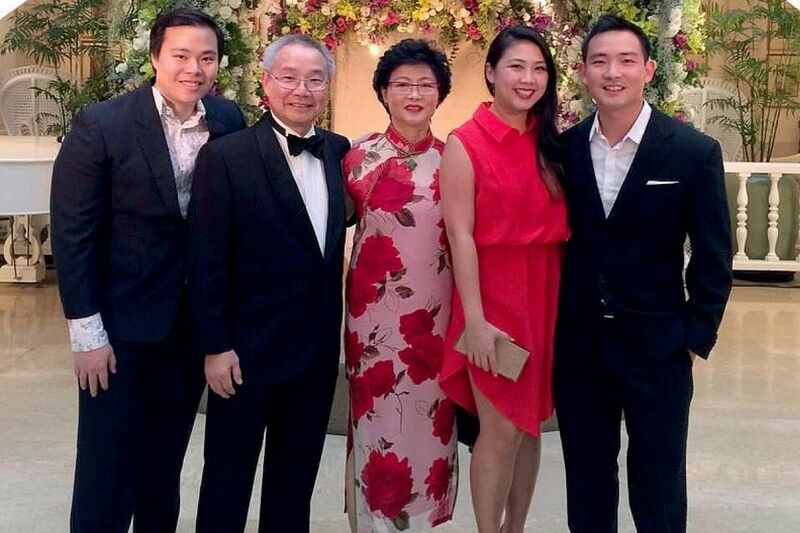 Huilin Quek and her brother Kwan Yi Quek were only six and three when their parents started Q Industries, a company supplying tableware to restaurants and hotels, in 1987. The idea for the business came from their mother, Mrs Jacqueline Quek, who had always loved hospitality and secretly harboured dreams of becoming an air stewardess in her younger years. Though she eventually took up work as a secretary in the cleaning chemicals trade in the 1980s, many of her company’s clients were in the hospitality sector, allowing her to build a network of contacts and dip a toe into the industry for her first business venture. With the support of her husband Tony Quek, who was then working in an American multinational company, Mrs Quek started the business here. After successfully supplying products to a variety of clients, she expanded into Kuala Lumpur in 1992 and Vietnam in 1994. At the time, the firm had 96 clients. 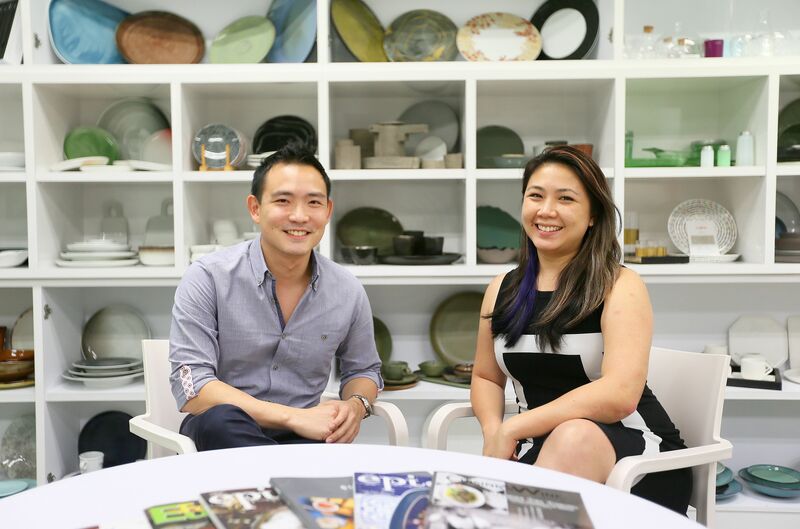 Husband and wife grew the business together and are still involved – Mr Quek being the “numbers guy” who handles finances and Mrs Quek, the risk-taking entrepreneur who oversees the product lines. The family business has grown by leaps and bounds since. It now serves more than 1,000 clients including international hotel chains such as IHG and AccorHotels, Michelin-starred restaurants and nightclubs in South-east Asia, India, Africa and the Middle East. No longer just a product distributor, the company acts as a consultant, providing exactly what chefs or hotels are looking for, based on their theme, budget and stylised direction. Q Industries’ product repository now includes kitchenware, buffetware, tableware, tabletop accessories, cutlery and linen for any theme under the sun, be it quirky, ornate or minimalist. Besides creating an in-house brand of flatware products in 1997, the family launched another housebrand in 2015, leveraging on its expertise to create professionalgrade kitchen utensils. Last year, the company marked its 30th anniversary with Q.I. Building, a new four-storey complex in Ho Chi Minh City. 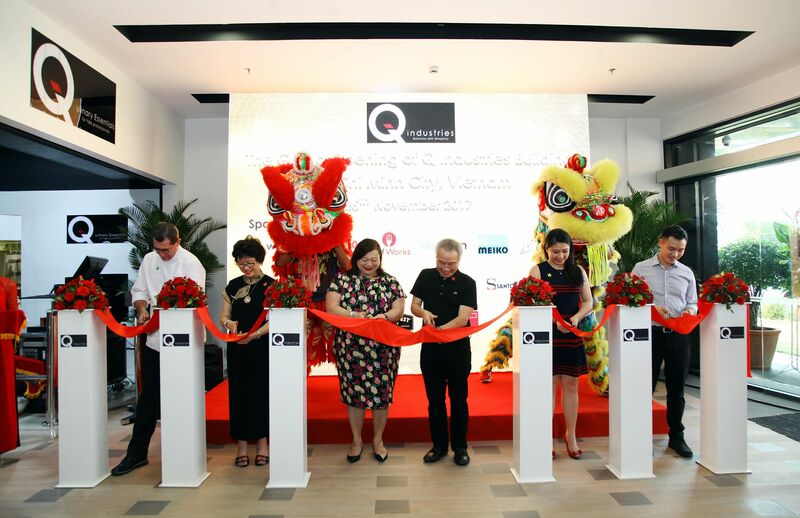 The 52,000 sq ft building has a warehouse, showroom and restaurant that showcases its products, a professional-grade kitchen that can be rented out by chefs or individuals and a retail outlet, called Q.ulinary Essentials. A similar 1,000 sq ft store opened in Singapore last October next to the company’s offices in Tan Boon Liat Building. According to Mr Tony Quek, the regional and global markets remain the main contributors to turnover, which has consistently been in the double-digits in recent years. It was also in October last year that 34-year-old Kwan Yi left his job in the Republic of Singapore Air Force (RSAF) to join the family business full time. Taking on the role of chief operating officer, the younger Mr Quek manages operations in Vietnam and lives in Ho Chi Minh City. The siblings have a 31-year-old brother, who is working in the nutrition and fitness industry and is uninvolved in the business. Looming over the duo is the notorious “second-generation curse” – the belief, as reported by The New York Times last year based on longstanding data, that only 30 per cent of family-owned businesses make it through the second generation. With such businesses, there is always a delicate balance. Many questions, such as when the next generation should come forward, if experimentation should be encouraged and when the first generation should ease its hold, have to be addressed. But though Huilin and Kwan Yi took different paths before coming on board Q Industries, they agree that their parents will always continue to be involved in the business. That open-mindedness shows as the senior Queks gave their children free rein to follow their passions, leaving them to decide if they wanted to join the business. It was this flexibility that led Kwan Yi to sign on to the RSAF to pursue his passion for flying. He has spent over 14 years in the military and as an officer in command managing a fighter aircrew of 40 and this experience comes in handy today as he oversees a team of 80 in Vietnam. Huilin, on the other hand, knew through her first job working at Starbucks in 1999 that she was interested in hospitality. She went on to study hotel management at Swiss hospitality school Ecole hoteliere de Lausanne after finishing her A levels at Anglo-Chinese Junior College. After graduation, she worked at The Ritz-Carlton in Singapore and the Legian in Bali as a hotel management intern before joining Q Industries in 2005. Even then, there was no special treatment accorded to her because she was the bosses’ daughter. Today, she handles the international division of the business, which explores new markets and business opportunities. Over her 12 years with the company, she has also spearheaded much of the digitisation of business processes. For the brother-and-sister duo, there is an acknowledgement that working in a family business comes with a unique sense of challenges – prime of which is the danger that work disagreements can become personal and sour relationships. For Huilin, working alongside her parents for so long has been a learning journey. It took some time for her to learn to distinguish between what was personal and professional. The fear of upending their relationship may have been why the two siblings spoke in depth for a year about Kwan Yi’s decision to join the business, before he eventually made the leap last year. Although Huilin admits having initial reservations, she says she soon realised the business was big enough for the both of them. Though it has been more than 12 years since Huilin Quek, 37, joined the family business in 2005, her younger brother, Kwan Yi, says she does not use her wealth of experience against him. Kwan Yi, 34, joined Q Industries last October after leaving his fulltime job at the Republic of Singapore Air Force. As of now, Huilin oversees the international division of the business, sourcing clients and opportunities in new markets such as the Middle East, while Kwan Yi oversees the operations of the firm’s 52,000 sq ft Vietnam facility, which opened last November. For Kwan Yi, it is working to their strengths that has helped the pair work well together. “With my military background, I’m used to discipline and pressure and it helped that I was the officer in command, managing a fighter crew of 40 in the air force,” says Kwan Yi, who moved to Vietnam just 10 days after leaving the military. The siblings’ close relationship and distinct roles have also helped them to sidestep conflict and align their business overall. Kwan Yi flies back to Singapore once a month, which is when the duo discuss how the different arms and markets are doing. He also frequently speaks to his sister to get her opinion on decisions as he learns more about the business. When Huilin Quek first joined Q Industries in 2005, she often sparred with her family due to differences in opinion. But it was during a restrategisation of the business in 2015 that her parents thought it best to bring in an external director, Mr Christophe Megel, as a qualified third party to add to their family-heavy management structure. Mr Megel was formerly executive chef at The Ritz-Carlton hotel and chief executive officer of a prominent culinary school in Singapore. “Having Christophe on board was important not only because he acted as a coach and mentor to me, but he also helped add another dimension to the discussions we had about the business,” she says. Her parents’ forward-thinking has come in good stead today as well, now that brother and sister work alongside each other in the business. “Having a neutral third party has helped because there is someone to mediate and provide balance to the conversation,” says Huilin. For the 37-year-old group chief executive, it also helps that she and her brother are aligned on where they see the company five to 10 years from now. “For many years, the hospitality services industry was very slow to change and very rooted in traditional sales techniques,” she says. The siblings’ goal is to disrupt the industry by not only providing what clients say they need, but leveraging on their experience to tell them what they might not have even thought of. The duo are now trying to automate more aspects of their supply chain and grow their own brands of products. For now, their facility in Vietnam is helping bridge that gap between the old and new, offering a showroom of their products and letting clients see the items at work at their 60-seat eatery, Q.itchen Factory.